Pediatric nephrologist Lisa M. Guay-Woodford, M.D., has been named to a three-year term as adviser serving on the National Institute of Diabetes and Digestive and Kidney Diseases (NIDDK) Kidney, Urologic and Hematologic Diseases subcouncil. Dr. Guay-Woodford, Director of the Center for Translational Science at Children’s National, is an internationally recognized expert in the mechanisms that modulate the clinical severity of certain inherited renal disorders, such as autosomal recessive polycystic kidney disease. 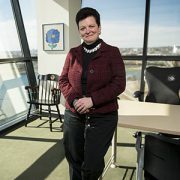 She holds the Richard L. and Agnes F. Hudson Professorship in Health Services Research at Children’s National. NIDDK, like other grant-awarding institutes within the National Institutes of Health (NIH), looks to its advisory councils for feedback on procedures that govern staff and manage its grant portfolios. The institute, the fifth largest at the NIH, supports clinical research about internal medicine and related subspecialties for many of the most common chronic health conditions. “It is a tremendous honor to be asked to serve on this important council. I look forward to providing advice and perspective on the exciting portfolio of NIDDK-funded projects,” Dr. Guay-Woodford says. The artist chose tempera paint for her oeuvre. The flower’s petals are the color of Snow White’s buddy, the Bluebird of Happiness. Each petal is accentuated in stop light red, and the blossom’s leaves stretch up toward the sun. With its bold strokes and exuberant colors, the painting exudes life itself. It’s the first thing Lisa M. Guay-Woodford, M.D., sees when she enters her office. It’s the last thing she sees as she leaves. Dr. Guay-Woodford, a pediatric nephrologist, is internationally recognized for her research into the mechanisms that make certain inherited renal disorders, such as autosomal recessive polycystic kidney disease (ARPKD), particularly lethal. She also studies disparate health disorders that have a common link: Disruption to the cilia, slim hair-like structures that protrude from almost every cell in the human body and that play pivotal roles in human genetic disease. Sarah, the artist who painted the bright blue flower more than 20 years ago when she was 8, was one of Dr. Guay-Woodford’s patients. 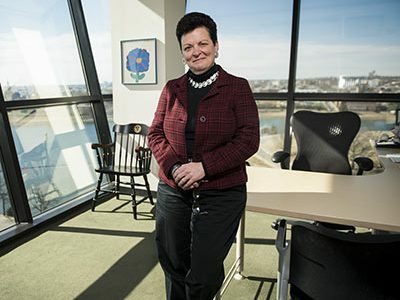 And she’s part of the reason why Dr. Guay-Woodford has spent much of her career focused on the broader domain of disorders tied to just a single defective gene, such as ARPKD. Two of her favorite patients died from ARPKD-related reasons in the same year. One died from uncontrolled high blood pressure. The other, Sarah, died from complications from a combined kidney and liver transplant. ARPKD is characterized by the growth of cysts in the liver, the kidney – which can lead to kidney failure – and complications within other structures, such as blood vessels in the heart and brain, according to the National Institutes of Health. About 1 in 20,000 live births is complicated by the genetic disorder. The age at which symptoms arise varies. That’s why it is essential to attain detailed knowledge about the defective gene responsible for ARPKD. To that end, Dr. Guay-Woodford participated in an international collaboration – one of three separate groups that 14 years ago identified PKHD1 as the defective gene that underlies ARPKD. The field is trying to emulate the clinical successes that have occurred for patients with cystic fibrosis, which now can be treated by a drug that targets the defective gene, attacking disease at a fundamental level. Patient outcomes also have improved due to codifying care. Standardizing clinical approaches dramatically improved and extended patients’ lives. “For renal cystic disease, we are beginning to do that better and better,” she adds. There’s no targeted medicine yet for ARPKD. But thanks to an international conference that Dr. Guay-Woodford convened in Washington in 2013, such consensus expert recommendations have been published to guide diagnosis, surveillance and management of pediatric patients with ARPKD. “There is an awful lot we can do in the way we systematically look at the clinical disease in these patients and improve our management. And, if you can overlay on top of that specific insights about why one person goes one way in disease progression versus another way, I think we can boost the baseline by developing good standards of care,” she says.